Momma Jorje: If not chemicals, then what? Use a grooming comb or hairbrush to remove tangles then divide the hair in sections and fasten off the hair that is not being worked on. I can't stress enough the importance of removing tangles before using a fine toothed comb. If you've ever tried to skip a brush and go right for a comb, you have some idea of this concept. Its even worse with a lice comb. Use the LiceMeister® comb to detect the presence of lice and nits. I will come back to information about this comb, I promise. This is not just a big ad for this product. It really is the end-all when it comes to lice combs! Using the comb, go through each section from scalp to the end of the hair. You can dip the comb into a cup of water, use a paper towel, or use the LiceMeister® comb cleaning device to remove any lice, nits or debris from the comb between passings. I was very impressed with the comb cleaning tool. I've never seen anything like it for combs and it works SO much better than the cleaning brushes! Still... I did not feel it necessary to use it between each swipe. Warm soapy water and/or paper towel works fine. 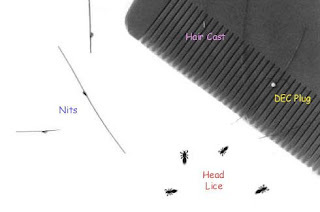 Look through that same section of hair for attached nits (lice eggs) and live lice. Nits are always oval-shaped, while usually grayish-white, they can vary in color. Viable nits are generally laid close to the scalp but can be found anywhere on the hair shaft. between nits and other hair debris. Remember, all lice-killing products are pesticides. If you choose to purchase an over-the-counter treatment, follow the directions carefully and use with caution. Consult your pharmacist or physician before applying or using lice treatment pesticides when the person involved is pregnant, nursing, has allergies, asthma, epilepsy, pre-existing medical conditions, or has lice or nits in the eyebrows or eyelashes. Never use products that contain lindane. Never use a pesticide on or near the eyes. Wash bedding and recently worn clothing in hot water and dry in hot dryer. Vacuuming is the safest and best way to remove lice or fallen hairs with attached nits from upholstered furniture, rugs, stuffed animals and car seats. Avoid lice sprays! With any plush toys, I bagged them and stuck them out of sight for 2 weeks. The comb should be boiled before use on different individuals. You don't want to spread the lice through your family in your efforts to eradicate them. Even under the best of condition, a few lice or nits may be missed. Use the LiceMeister® comb to screen the infested person every day and regularly thereafter. Seeing a nit or two the next day does not necessarily mean reinfestation. However, be sure to remove them immediately. Being consistent and diligent about screening and manual removal will go a long way toward controlling the problem. I had a hard time with the consistency, especially when working on a 1yo toddler's head... until I found the best setting for us. If additional nits (at least 3-5 per day) are discovered, this may signal that live lice may be on the head. Another thorough manual search is recommended at that time. Remember that each day is a new day for the risk of a new infestation. Routine screening is vital for anything that may have been missed and also for identifying a new infestation as early as possible. Deb often reminded me that find a louse on a new day was not a bad thing, it was a good thing. It was one less louse laying eggs! Proceeds from the sales of the LiceMeister® comb on their site help support the NPA's programs of education, prevention and research. To see my previous posts about lice, including our own battle with lice on Sasha's 1yo little head and a list of links on Lindane (the active ingredient in most lice treatments), click my lice label.